Screen shot from Newseum. Red highlight by PP Blog. 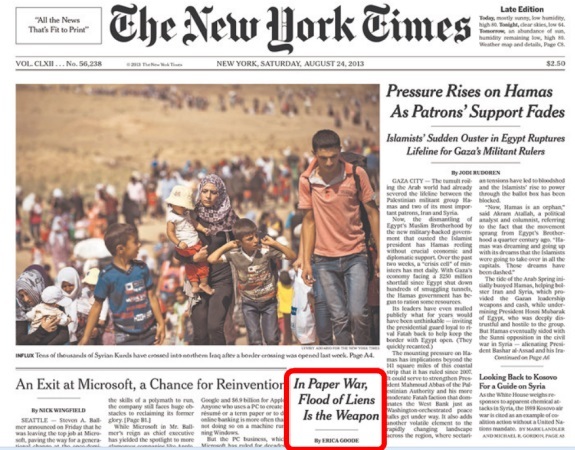 UPDATED 2:31 P.M. EDT (U.S.A.) A story on bogus liens filed against a Minnesota sheriff and others received prominent treatment in the New York Times today, appearing on Page A1 (the cover page) — and above the fold in the New York edition. The Eilertsons paid attention to a “sovereign citizen guru” who pitched a lien-filing strategy described as “death by a thousand paper cuts,” the Times reports. In June, the Eilertsons were sentenced to 23 months in state prison — and the Times sent a reporter to talk to Thomas Eilertson. Quick note. The PP Blog was knocked offline twice over the weekend, with the combined outages lasting four hours-plus. I do not believe the downtime was related to this story, and I haven’t pinpointed a cause. Also: The Blog was knocked offline at approx. 8:31 this morning for a period of about 28 minutes. This appears to be related to IPs from China, but I haven’t had time to check it out fully. Earlier today, I awoke to a bucket full of spam that seemed to be bot-driven in intervals of two or three minutes. Whoever is doing the spamming appears to have the ability to strip content snippets from other sites and send them to the PP Blog in an apparent bid to sell purported designer goods. At the moment I’m writing this sentence (9:12 a.m.), I am observing six separate IPs from China trying to pull multiple “old” stories on the Blog. It’s as though someone feeds them into a cannon — and whoever is doing it has an ability to create multiple IPs on the fly from an apparent IP base in China that begins 110.85. . . .
That’s not the sole IP string, though. There recently also has been an uptick in bids to send executables to the Blog. This same pattern was present during the 2010 DDoS attacks against the Blog and the follow-up traffic floods in 2011.